This 4-hour shore excursion provides access and transportation to Great Bay Beach in Philipsburg. Lounge on the idyllic beach in with a provided lounge chair and umbrella and listen to reggae rhythms. Includes choice of rum punch, beer, soda, or water and round-trip transportation from the Philipsburg cruise port. Your half-day excursion to Great Bay Beach begins with pickup either at the cruise port or a nearby central meeting spot. Climb into your tour vehicle for the ride to Great Bay Beach. 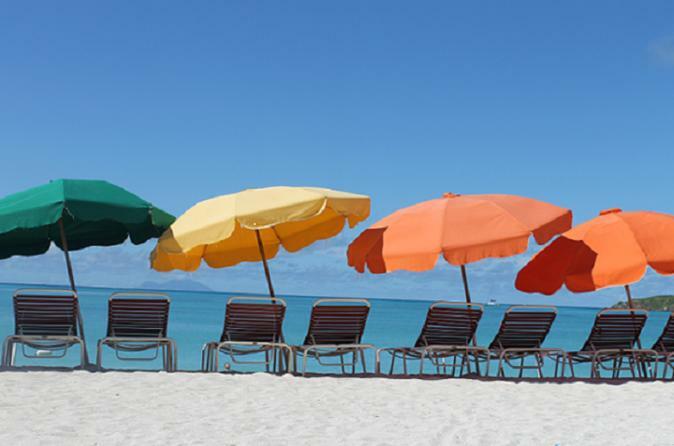 Upon arrival, you'll get set up with a lounge chair and umbrella in a prime boardwalk location. You can choose from a selection of water, soda, beer, or rum punch for refreshments. Front and Back streets are right around the corner if you'd like to do some shopping, and there are restrooms available on the boardwalk. Lounge in the sun and listen to reggae grooves. Go swimming and walk along the shoreline until it's time to return to Philipsburg via water taxi.